Welcome back to the Circus. After a weeks break, it’s time for the last lap of the season. It is crunch time for both these teams but for very different reasons. Leicester, in their second season back in the EPL, have a chance to do the near-impossible and win the league outright. Norwich, may well go right back down from whence they came. It is a Janus faced situation with the Foxes grinning wildly whilst the Canaries’ countenance is fixed with a fear of heading back down the mine. With no FA Cup action to distract them last weekend, Claudio Ranieri decided to give his table-topping charges the week off to recharge their batteries in whatever way they saw fit before the final charge to the line. The manager is exuding an air of calm and positivity which is surely born of his long experience in the game; experience that tells him just how unlikely the situation his team faces is and crucially that they should enjoy the ride without questioning it. This is not the time for a sober evaluation of their achievements thus far. Which likely stands in stark contrast to the mental anguish Norwich manager Alex Neil must be dealing with as he struggles to find a formula to arrest their slide toward doom. They have just ten points from their last ten games and sit even on points with 17th placed Newcastle. When you’re sharing a ledge with this Newcastle team, you know things aren’t going well. The only thing that stands in Norwich’s favour is that they might, just might, have a slim chance of catching Leicester cold. Whilst the Foxes where off sunning themselves in warmer climes, it’s highly likely that Alex Neil was running an extended boot camp, the sole focus of which being this match against the league leaders. 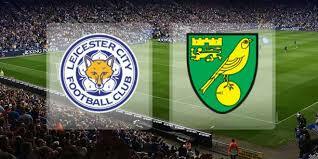 If Norwich can get out of the blocks quickly and post an early score, they might just unnerve Leicester enough to grab something from this match. Now, with the proviso that Leicester are rightly adjudged by the bookies and anyone with a modicum of common sense to be the favourites to win this match, this column will step once more unto the breach of idiocy and swim against orthodoxy by plumping for a draw. Why? Because we’re stupid like that. BetFred has 7/2 for the draw. Good god, will someone from Utd just say something?! This constant will he/won’t he regarding manager Louis van Gaal’s fixity of tenure is doing this column’s nut in. If Ed Woodward would just issue a statement regarding the Dutch man – something as simple as confirming he’s there until the end of the season – it might manage to suffocate to some degree the emulsified horse offal that is passing for journalism in so many of the papers recently. Having said that, this sideshow is mildly more entertaining than anything the footballers have managed recently. The bar has shot very low for this tottering giant. Utd’s last encounter in the league saw them beaten by Sunderland of all teams. Following that they were beaten away from home in the Europa League by some Danish people called Midtjylland. A restorative victory over a tame Shrewsbury in the FA Cup might have lifted some of the pressure surrounding the manager and his dreary men but a defeat here would surely see all previous angst quickly restored with the attendant calls for van Gaal’s head to be swapped for Mourinho’s, a truly terrible spectre. A slight steadying of the ship for Arsenal has seen the Gunners climb to within two points of the summit. One wonders whether their confidence took a rattling after their entirely unavoidable loss to Barcelona midweek but it can be said for certainty that they have lost Oxelade-Chamberlain to injury after his shin bent in a manner that you’d rather not see, Luckily for Arsenal, with Wellbeck back from injury and Joel Campbell having proven his worth of late, they are well stocked in that area. The question, as always with Arsenal, is do they have the mental fortitude to take this gilt-edged opportunity to put one over on Utd and announce themselves as genuine title contenders for the season’s run in? Rarely has a team spoken so often about the mental strength within the dressing room only to be cruelly exposed time and again afterwards. If it were down to skill and tactical ability alone, then Arsenal would be a shoe-in for this match but they always come with the same baggage of imponderables. And it is on the basis of their superiority over Utd in nearly every aspect that this column will back the Gunners for a win here. Utd just don’t seem to working at all as a team recently and it’s difficult to see from which hat they might pull a trick. It is Arsenal and so there is always a bonus trick somewhere that they can avail of but it just feels highly unlikely that they will. The best price for an Arsenal win can be found with MarathonBet at 13/8. Speaking of teams looking to make a big statement, you very much get the felling that after a season of stalking the front runners, now is the time for Spurs to kick on. Level on points with Arsenal in 2nd and only two points off the pace, over the last ten games Spurs are clear leaders in the form table having only dropped five points. This is the form of champions. Whilst they were beaten by Palace in the FA Cup ficture, it is unlikely to bother them too much as their schedule is heavy enough as is. In fact, the greatest threat that they face is likely their demanding run of games in both the EPL and the Europa League. Decreasing energy levels coupled with a choice injury or two might spell trouble for the London club. Pochettino, however, has been very judicious in his squad rotation and his clever management of personnel might be enough for them to successfully compete on both fronts. Given how turbulent the final months of Garry Monk’s reign at Swansea were, it is remarkable how well they have picked up in form after the appointment of new manager, Francesco Guidolin. Whether this swing in fortunes is down to the Italian’s rapid input, the players reacting positively to the new boss or both, they have picked up a respectable eight points from their last five games and are showing definite signs of recovery. There can of course be no complacency as they are still just three points above the relegation zone but running concurrently with their good form is the largely awful form of those below them. One of Swansea’s biggest problems coming into this match is their lack of firepower up front. In their last five games, they have only once scored more than a single goal with most of them coming from their Icelandic whizz, Sigurdson. Unfortunately for them, they are coming up against the meanest defense in the league and will have to make the most of every opportunity they get, should they get any at all. It’s unlikely that Spurs will approach this game in any other way than how they usually do – press high, hunt in packs, win back possession and attack. They will not make life easy for Leon Britton and the Swansea midfield and will look to harry them at every opportunity. It will be interesting to note, however, if tiredness does become a factor for them after the 70 minute mark but even so, they should have enough in the tank to account for the visitors. The best price for a Spurs win is 12/25 from SportingBet.